SPECIAL!! Free Postage on all products! This stainless steel hook lock pick set is the kind our investigators carry every day. The lock picks includes 1 x broken key extractor + 12 x single-hooks + 2 x transmission file tool. The kit includes most styles of rake, hook, diamond and diamond-hook. This Pick Gun has a strong spring which could easily pick pin tumbler and disc tumbler locks. It comes complete with 4 pick blades and 1 tension wrench. The coating of gun consists of lacquer can resist stain and rust. For when the Pick Set isn't getting the job done, and you can afford the clicking noise the gun makes. Rechargeable lock pick gun with LED illumination built in. Adjustable, with 8 picks and a power adaptor. It will open most of pin tumble Locks, dimple Locks, Cross Locks, 2-side and 4-side Auto Locks. This trail camera is similar to the ones our investigators deploy in the field to collect evidence of people's comings and goings. With an invisible 940nm night-vision flash and a camouflaged case, it hides well in a roadside verge or garden. With MMS and email, is triggered by warm (human, animal, vehicle) movement, using a sensitive Passive Infrared (PIR) motion sensor, and then automatically captures high quality pictures (up to 12M pixels) or records 1080p HD video clips. This tiny night vision stand-alone camera can takes video and photos in the dark, or full colour in daylight. Small enough to sit on a table pointed at your target and be virtually invisible. Strong, lightweight, digital night vision with colour display is safe for using in daylight (will not burn out) as well as at night. With a 2x magnification it runs on ordinary AA batteries. It's also water resistant and has a built in Ir illiminator for those extra-dark places. A must-have for identifying CCTV locations at night. Water resistant; light rain is ok, heavy rain or submersion not recommended. Secure your home or office with these recording, motion detecting, night vision capable cameras. They connect to your existing Wifi network for remote viewing on an android or iphone, or via the web. They also take a microSD card and record onto themselves, so there is no need for a central CCTV server. 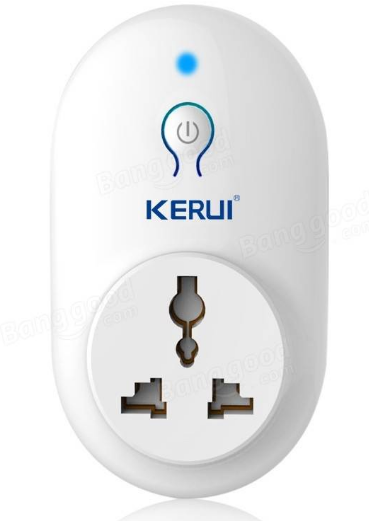 Plug &Play (P2P) No DDNS or Port Forwarding needed. MicroSD Card recording up to 128GB allowing remote playback. Place this unit in a garage, shed, or in your home or office, to alert you when someone is where they shouldn't be! The stand-alone unit is battery powered, and arms/disarms with a remote control. Perfect for those concerned someone is sneaking around in their yard or home while they're asleep; the ear-splitting siren will wake even a stubborn sleeper. Portable enough to take camping or use in a hotel room. 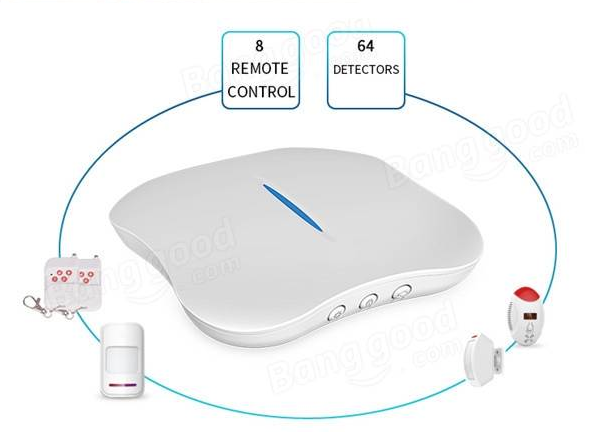 This easy to install alarm system connects to your existing Wifi network to keep you in control and alert you when triggered. It comes with both a door/window trigger and a Passive Infrared trigger, as well as two remote controls, but is expandable up to 64 triggers and 6 remotes. Download the iPhone or Android app for full control over the system, including push alerts. If your wifi goes down, it can also be connected to a regular phone line and be programmed to dial-out to a nominated number. 8 zone types including Normal, I'm at home, Emergency, Doorbell zones. For details on our fully installed CCTV and Security Systems, click here. Shopping Cart full? View your Cart and proceed to payment here. Remember all postage is FREE until the end of 2016!